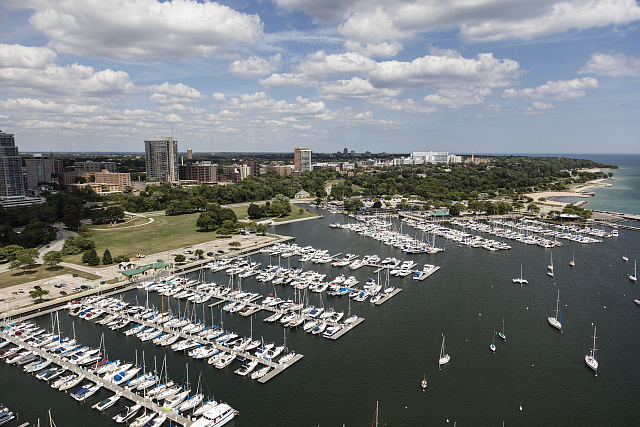 Since its founding in 1846 at the site where the Milwaukee, the Menomonee, and the Kinnickinnic Rivers join to flow into Lake Michigan, Milwaukee has depended on its waterways for business, industry, and recreation. These waterways were important features of the city and county parks that were created starting in the late nineteenth century. Indeed, many of the parks were connected by water and people could row or portage from one park to another. 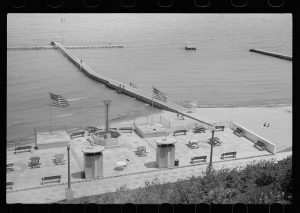 Luddeman’s-on-the-River, in Shorewood, began in 1872 as a popular summer resort and after numerous name changes became Hubbard Park sometime after 1917. Extending for half a mile along the Milwaukee River, it featured bathing and boating facilities and was once the home to the Milwaukee Rowing Club. A lagoon and creek were important elements of Bay View’s Humboldt Park, which opened in 1891. Rowboats were available for rent at the park’s boathouse. The park still serves as a community center for Bay View and still offers opportunities for water recreation. One of the oldest boating associations in the area is the Milwaukee Rowing Club, founded in 1894. For nearly 100 years, the members rowed on the Milwaukee River above the North Avenue dam. This area was the chief recreational location for swimming beaches, swimming schools, as well as canoeing and rowing clubs. The Club has survived for over well over a century. Its current headquarters is in the Beerline River Homes and River Court development at 1990 North Commerce Street, less than a mile from its original site. It provides access to the Milwaukee River for kayakers and canoers, who can often be seen on the River near this area in early morning and early evening. Milwaukee’s waterways are also popular among motorboat enthusiasts, which is appropriate since the first outboard motor was developed in Milwaukee in 1909. The official narrative behind the invention is a love story. When Ole Evinrude took Bessie Cary for a picnic on an island on Okauchee Lake, the young woman expressed a desire for a dish of ice cream. The two-and-a-half mile trip in a rowboat caused the ice cream, to melt, of course, and this incident inspired Evinrude to design an engine to replace the oar as a means of boat propulsion. A year after marrying Bessie 1906, Ole founded Evinrude Motors in Milwaukee. The firm’s first outboard motor became an instant success when it was introduced in 1909. Milwaukeeans have long enjoyed the opportunity to sail on Lake Michigan and they have formed several associations over the years. The history of sailing in Milwaukee dates to 1871 with the formation of the Milwaukee Yacht Club. It is the oldest active yacht club on Lake Michigan. It was actually founded on a site north of the Milwaukee River, and its first clubhouse was constructed in 1896. William George Bruce, a founding member of the Yacht Club and head of the Milwaukee Harbor Commission, led the effort to build the outer breakwater in the decades before the Second World War. During the 1960s, the breakwater was improved to better protect the boat slips in McKinley Marina. And in 1967, after resolving land disputes with the county, a two-and-a-half story, 9,500 square-foot brick building was constructed. Today, the club provides boat storage, docking and launching to its members. Their facilities provide year-round activities and amenities. In 1913, a group from Bay View created the South Shore Yacht Club to encourage the recreational development of the south-side shoreline. They used a derelict lumber schooner, the LILLY E, as a floating clubhouse when they were forced out of their first clubhouse. Their founding commodore was William “Pop” Barr. In 1938, construction of a more permanent clubhouse began after the demise of the LILLY E. In 1935, sailing was made available to young people with the beginning of SSYC Juniors. In 2013, the SSYC celebrated 100 years. The youngest yacht club in the area is, nevertheless, over sixty years old. In 1950 the South Milwaukee Yacht Club was created. It currently accommodates around 95 boats on a 14-acre site and is wholly sustained, funded, and maintained through the efforts of the club members. These associations were, of course, private clubs. But Edward Seaver III and Douglas Drake envisioned a community organization to make sailing accessible to all people in the Milwaukee area. The Milwaukee Community Sailing Center became a reality in 1980 when it opened with lessons and boat rentals. Today the Sailing Center offers both adult and youth members sailing courses that range from basic to advanced. The center also offers regattas, volunteer instructor opportunities, and open sailing seven days a week on a variety of sailboats. The Sailing Center partners with local organizations to provide sailing opportunities to thousands of at-risk and economically disadvantaged youth and to physically challenged adults. Because of its accessibility to the three rivers on which it was founded and to Lake Michigan, throughout the city’s history Milwaukee residents have used the area’s waterways, not only because of their central role in the region’s economy, but also for their potential as sites of recreation and leisure. ^ “Humboldt Park History,” Humboldt Park Friends, accessed April 7, 2017. ^ “MKE in Wonderland: How an Amusement Park Created the Village of Shorewood,” accessed April 7, 2017. ^ “History,” Milwaukee Rowing Club, accessed April 7, 2017. ^ “An Evinrude Motor,” Crowley Marine, accessed April 7, 2017. ^ “A Proud Heritage,” Milwaukee Yacht Club, accessed April 7, 2017. 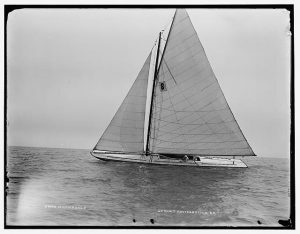 ^ “Blue-Collar Beginnings,” South Shore Yacht Club, accessed April 7, 2017. ^ “Club History,” South Milwaukee Yacht Club, accessed April 7, 2017. ^ “The History of Milwaukee Community Sailing Center,” Milwaukee Community Sailing Center, accessed April 7, 2017. Albano, Laurie Muench. Milwaukee County Parks. Charleston, SC: Arcadia Publishing, 2007.